Australia’s gulag mimicry – a prison first, justice second mentality that governs boat arrivals – has done wonders to challenge any stance of distance humanitarian organisations might purport to have. To see the suffering such policies cause is to make converts of the stony-hearted. What matters in this instance – the MSF condemnation of Australia’s innately brutal anti-refugee policy on Nauru – is its certitude. Undertaking a journey from war torn environs and famine-stricken lands might well inflict its own elements of emotional distortion and disturbance, but Australia’s policy of keeping people isolated, distant and grounded took it further. It was penal vindictiveness, a form of needless brutal application. It is time to end Australia’s barbarous treatment of people attempting to reach Australia by boat. Offshore detention for the purposes of assessment may be acceptable providing all cases are processed quickly and humanely within 3 months or so. The deprivation of liberty of people who have committed no crime is itself a crime. The indefinite detention of asylum seekers and refugees is a crime against humanity. The failure to honour the Government’s duty of care is a crime against humanity. The Government’s attempts to disparage suffering people and keep them out of sight and out of mind are despicable. The Government’s shameless attempts to justify its stance plus its underhand manipulation of events and obfuscation over it’s relation with the corrupt autocracy of Nauru are a national disgrace. 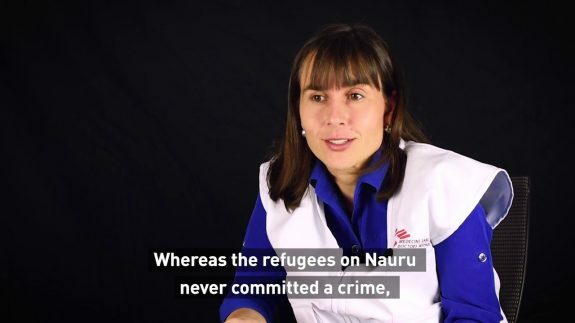 I wholeheartedly support Medicins Sans Frontieres’ position on their ejection from Nauru. “Médecins Sans Frontières (MSF) strongly condemns the sudden decision of the Government of Nauru to end MSF activities and expresses high concern for the conditions of the patients that we have been forced to leave behind. MSF calls for the immediate evacuation of all asylum seekers and refugees from the island so that they complete their resettlement process in a place of safety with dignified conditions. Dutton and co surely hit an unimaginable new low with this latest effort. I say it because, though worse things have happened this century, this situation more than any had an easy solution for anyone who had learned from these things and wasn’t a sadistic lunatic. The fascist Liarabral Party including the Monster for Xenophobia, Putrid Dutton, are pursuing inhumane policies designed to make Australian voters fearful of any person who cannot afford to fly into Australia on a regular international airline. So, The present Peoples Republic of China (PRC) policy of external migration for young Chinese citizens continues without restriction and the interest of the PRC government supported young Chinese business persons is very evident in regional urban centres where they are making a positive difference to their respective local economies that the Australia LNP misgovernment chooses to neglect and ignore while pouring billions into already over-crowded and polluted metropolitan cities. This PRC policy has been in place since about the 1988 Tianamin Square assassinations, as a trade off against the multi-BILLION foreign student investments by PRC that props up a top heavy administrative mess known as the Australian university tertiary system. This rather ironical position by the LNP misgovernment ignores the history of “traditional” immigration programmes that brought thousands of white European migrants out of the post WWII economic disaster that was war ravaged Europe on ocean liners. These immigrants were looking for the opportunities offered by a new start Down Under, resulting in the arrival of Julia Gillard, who became Australia’s first Lady Prime Minister, and Tony “Toxic” RAbbott, the Wanker of Warringah. There is little doubt that the present policy of off-shore detention of persons shown to be refugees is little different to the concentration camp policies of the German Nazi Party after 1933 with Gypsies and political prisoners. I look forward to working on the election campaign to “Dump Dutton” and consign this ILL-liberal misgovernment of self-serving Parliamentary Allowance rorters and self-indulgent adulterers to the WPB of political history. Women supporting Adultery support National$. I remember how ordinary caring Italians put teddy bears and flowers on the coffins of asylum seeker children whose bodies were pulled of the sea…. Yet they keep on confounding me. Perhaps its just the anchor dragging and bouncing along the bottom. New England Cocky, are you suggesting that most Tory women are harlots?